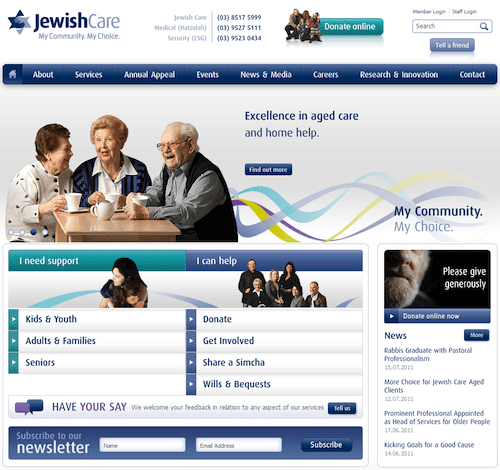 The newly redesigned website of Jewish Care has been launched this month aiming to extend the reach of all Jewish Care’s services and programs to the entire Victorian community. The new website features expanded content, photo and video galleries, news and media pages, an events calendar highlighting Jewish Care and community events, an improved donation page, job and volunteer listings, brochure downloads and much more! “Our visitors will now experience a more vibrant and complete view of what Jewish Care has to offer the Victorian Jewish community.” says Bill Appleby, Jewish Care CEO. The site has been designed to provide quick and easy access to over 250 pages of resources for all audiences. And if a user is not exactly sure where to look for specific information, the newly improved site-wide search engine will help find what they are looking for. “We believe the new site reflects our commitment in keeping our online audience of both general visitors and industry professionals up to date about Jewish Care with current information,” Appleby says.